Professional farmers and backyard gardeners alike need to be able to identify crops. Though farmers and gardeners tend to label crops at the point of planting, when those labels are lost or not assigned properly, it is useful to know some basic identification tips. Vegetables and fruits can be identified as early as when they first emerge from the soil or by their particular leaf, flower and fruiting characteristics as they mature. When crops first emerge from their seeds above the soil, their first leaves are called cotyledons. Plants will either have dicotyledons or monocotyledons. Dicotyledons (sometimes simply called dicots) will have two leaves attached to a single stem. Broccoli and tomatoes are examples of dicots. Moncotyledons (also called monocots) have only one leaf attached to a stem. Corn is a monocot. A majority of vegetable and fruit crops are dicots; therefore, you may want to further learn to identify dicot leaves. For example, broccoli dicot leaves are heart shaped, where as tomato dicot leaves are long and narrow like a sword. If you are patient and can wait to identify your crop until it has matured several weeks, you should be able to identify it by its obvious edible parts. Peas, for example, will eventually produce small, white flowers followed by the emergence of pods. Broccoli will begin to crown in the center of plant. This crown is the recognizable head of the broccoli that is eaten. The difficulty with waiting to identify crops by their edible parts is that you may not identify the crop in time to apply necessary fertilizers and amendments. Leaf identification is a common way to identify both ornamental and edible plants. Root vegetables such as carrots and potatoes have distinct leaves that grow above ground, while the edible root of the plant grows below ground. Carrots leaves are thin and fan like, while potatoes have larger leaves on multiple stems. 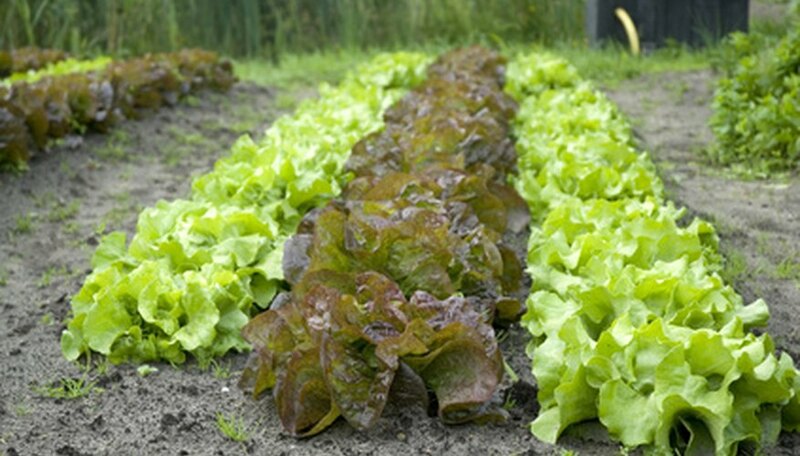 Many crops such as lettuce, spinach and arugula are grown for their edible leaves. Each has a distinguishable leaf from the other. Lettuce leaves are broad with smooth or serrated edges. Spinach has smooth leaf edges and tend to be darker green than lettuce leaves. Arugula leaves are lobed and narrow. Crops are grown at different times of year. Greens such as spinach and arugula grow best in the cooler temperatures of the spring and fall. Hot weather crops such as tomatoes, peppers and eggplants grow at the height of summer when they receive the most daylight and consistently warmer temperatures. You can assist your crop identification search by noting what time of year the crop is growing. There are several resources available to farmers and gardeners for help with crop plant identification. The USDA maintains a plant database that is searchable by scientific or common name. Enter the name of a crop and it will show you the plant's basic characteristics. Perhaps your best resources for plant identification are your fellow gardeners. Take a picture of your unidentified plant to show to other gardeners, your local extension office or a long-time farmer.